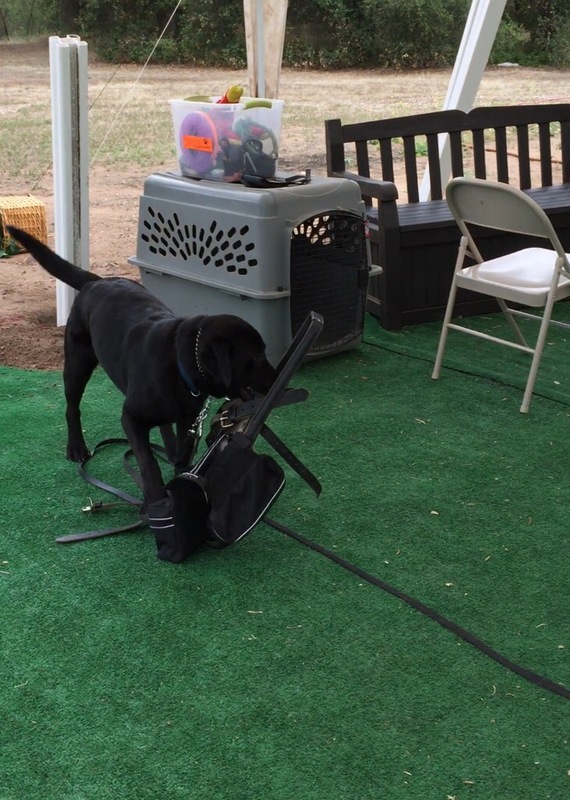 The second day of handler training was more interactive than the first. I worked with a trainer named Savannah who I hadn’t met the previous day. One of the new things I learned was how to put the mobility harness on Dyson. Dyson took treats from my hands a bit gentler than the day before. He was a much calmer dog overall, while still being engaged and enthusiastic. After reviewing and practicing “watch me” and “touch” she proceeded to teach me more commands. Some of the commands we went over, like sit and come, are used by many people as basic pet dog obedience. 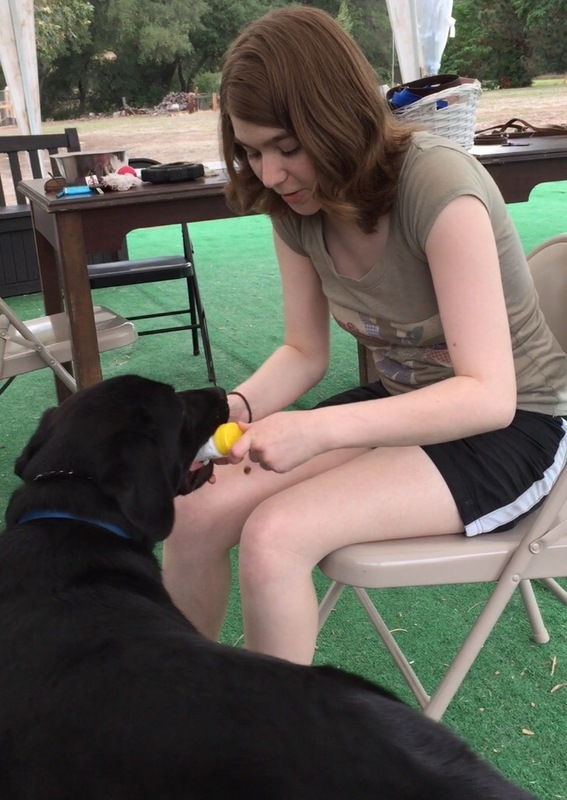 We quickly progressed to working on actual service dog tasks though. The “paws up” command is one of my favorites. Dyson drapes his upper body over my legs. This is called Deep Pressure Therapy, or DPT. It can help decrease my physical pain and achiness, as well as decrease anxiety. I’ve always enjoyed weight on me, which is a common sentiment of those with ADHD and sensory processing disorders. It was definitely relaxing. It’s easy to hug him at the same time, adding another level of comfort. I also learned the alert command. When I use the associated hand signal, which is a sort of fist swirl at knee level, Dyson paws at me. In the future, whenever I notice that I am feeling bad, I will tell Dyson to alert. When anyone else notices changes in my body (such as pale skin), they are also welcome to let me know so that I can tell him to alert. Eventually he will associate the changes in my body that cause my symptoms with the alert command. 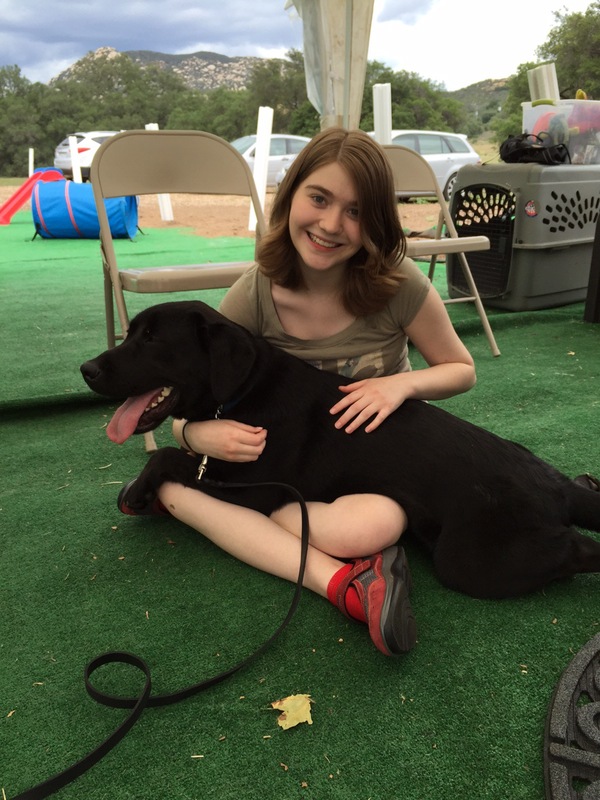 Dogs can pick up on signals that humans can’t, which is what the more commonly heard of seizure alert dogs, and more recently, diabetic alert dogs, are trained to do. My dog will hopefully begin to pick up on my low blood pressures and high heart rates. There may be other factors he uses as well such as the pace of my breathing. Then he will alert me to them, which allows me to know that I should rest for a minute before I get dizzier, my vision goes black, or I pass out. Another command I worked on is “get it.” I point to an object, say “get it,” and Dyson goes to pick it up in his mouth. I then say “bring it” and he does just that. This retrieval of items is so helpful to me. Postural changes cause an increase in my symptoms, which means that bending over to pick up a dropped item isn’t easy. Being a retriever, Dyson enjoys doing this for me. He darts so quickly to retrieve items, wagging his tail the whole time. I’m glad for this because I wouldn’t want to forcefully work a dog that doesn’t like doing it. Another retrieval-related task that Dyson performed for me is “vest”. I cross my arms over my body and say “vest,” which leads to Dyson looking around and sniffing for his service dog vest and harness. No matter where it’s hidden, Dyson finds it. Once Dyson locates it, he carries it to me. Although it’s big and bulky, Dyson always drags it back to me, happy to help and hoping for a treat. This task really showed off his intelligence and made me feel even more excited to be working with him. “Vest” is a very helpful task because the vest pockets can hold needed items, like medicine, a phone, an epipen, and water. When I’m very fatigued and dizzy, getting items for myself is really hard. I feel safer with Dyson. I now know that no matter how ill I am, Dyson can bring a phone for ER calls and emergency meds, all by me saying one word. This is so cool, amazing what they can do. So happy and excited for you! I’m looking forward to reading along with your journey.